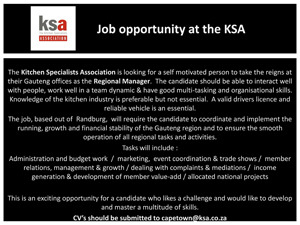 The Kitchen Specialists Association is looking for a self motivated person to take the reigns at their Gauteng offices as the Regional Manager. The candidate should be able to interact well with people, work well in a team dynamic & have good multi-tasking and organisational skills. Knowledge of the kitchen industry is preferable but not essential. A valid drivers licence and reliable vehicle is an essential. The job, based out of Randburg, will require the candidate to coordinate and implement the running, growth and financial stability of the Gauteng region and to ensure the smooth operation of all regional tasks and activities. This is an exciting opportunity for a candidate who likes a challenge and would like to develop and master a multitude of skills.